Advocate staff photo by PATRICK DENNIS --A vintage photo Rachel Scott-Hicks with her two sons Beverly Hicks, right, and Nace Hicks, Sr., left. Advocate staff photo by PATRICK DENNIS --Jessica Tilson replacing a photo of her great, great grandparents on the wall in the home of her grandfather Burneal Poole. Advocate staff photo by PATRICK DENNIS --Burneal Poole, from Maringouin, holds a photo of his parents Benjamin and Eleanor Poole. Growing up in tiny Maringouin, Jessica Tilson often heard that everyone in town was somehow related. 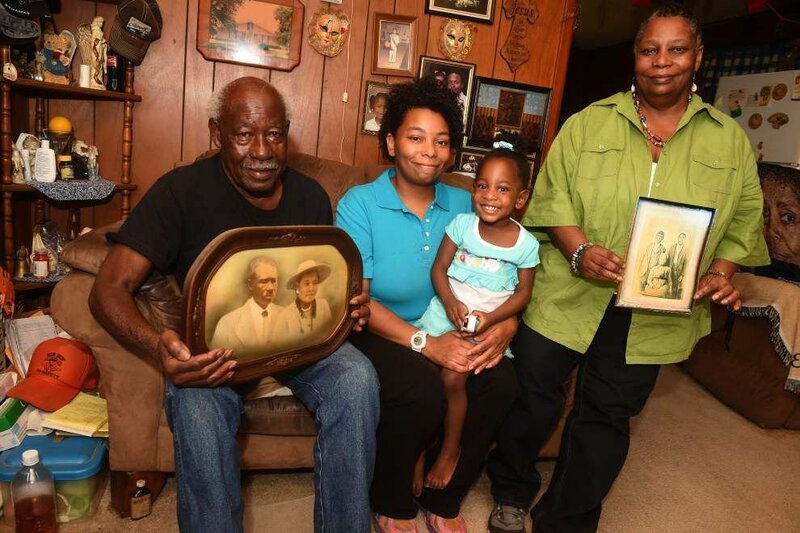 The 34-year-old Southern University student brushed off the statements as just a colloquial expression for the kinship residents living in the quaint Iberville Parish town felt toward one another. However, Tilson recently learned more than just geography and skin color bonds her to many neighbors, classmates and fellow church members. She shares blood connections with them as well. She also now understands her family’s long connection to the Catholic faith and the tale that one of her ancestors implored family members to retain ownership of more than 60 acres of farmland near La. 76 in Maringouin that he purchased in 1898. It all traces back to the sale of 272 slaves in 1838 by the Jesuit priests running the institution of higher learning known today as Georgetown University. The group of men, women and children ended up in Louisiana, mostly working plantations in Iberville and Ascension parishes. Tilson recently discovered she is the descendant of at least eight slaves the Jesuits sold to pay off mounting debts that could have forced the school to shut down. Her family tree — populated by marriages between the children of the Georgetown slaves — gives researchers of the sale keen insight into how the slaves tried to maintain a sense of community and hold onto traditions dear to them despite the harsh realities they faced as the forced labor for wealthy, white plantation owners. Over the past school year, students, alumni and professors at Georgetown have examined the slave sale, coming to terms with its financial importance to the Catholic university and figuring out how the modern institution should honor people once deemed to be mere property. The sale has gotten national prominence with articles published by The New York Times, including one in April that chronicled the sale and the circumstances of the slaves’ subsequent lives on rural plantations in Iberville, Ascension and Terrebonne parishes. The article also revealed that Maxine Crump, a former Baton Rouge television news anchorwoman turned community activist, was a descendant of Cornelius Hawkins, a 13-year-old boy named in the sale documents. But it was an article also featuring Crump, published by The Advocate in May, that sent Tilson on a fact-finding mission of her own. Tilson has spent hours upon hours over the past month tracing her family’s origins as far back as she could, making connections to 1838 sale. She admits digging into her family’s past is both exciting and frustrating. Reading some of the written statements that have been uncovered from priests involved in the sale struck several emotional chords for her. “As a human being, how can you listen to someone begging — pleading — for their lives and family? And their cries and pleas fell on deaf ears,” she said. “They were enslaved in Maryland already, but they didn’t want to go Louisiana. It pissed me off extremely when (the priests) decided that educating white children meant more to them than my family’s well-being. Tilson’s research unearthed the intricate — and sometimes confusing — web linking her family to many others who share her native roots in Maringouin. But it also has led to the discovery of family she never knew she had — like the husband and children of Karran Harper-Royal, who are her distant cousins. Like Tilson, the news coverage of the Georgetown sale sent her on a hunt into the past. Both women found themselves making frequent trips to the Louisiana State Archives building, where one day, they met while searching for the faint footprints their ancestors left behind through historic documents. Crump learned about her connection to the 1838 slaves from the founder of the Georgetown Memory Project, a nonprofit dedicated to finding the descendants of the slaves. 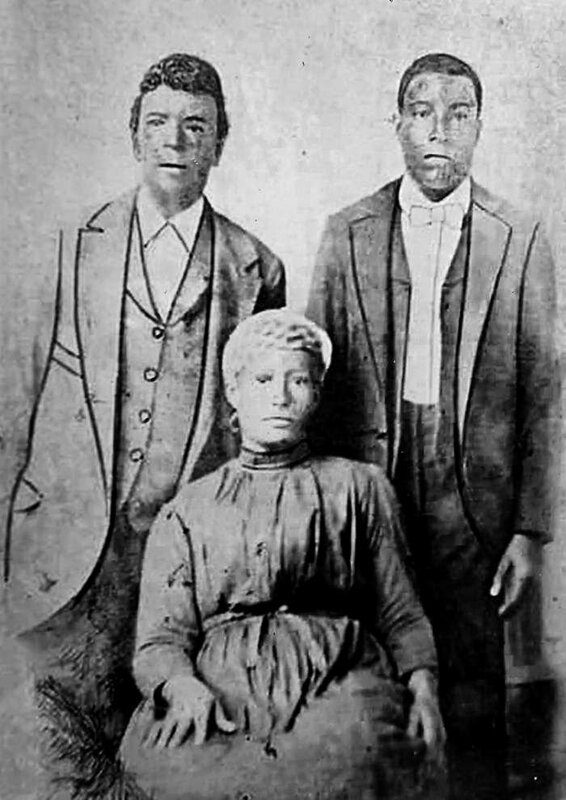 The nonprofit hired Baton Rouge genealogist Judy Riffel, who had knowledge and experience investigating the lives of the Georgetown slaves, as she had done this work a decade earlier for a woman whose family tree also extended back to the sale. Like she has done for many others who now suspect they could be the descendants of the Georgetown slaves because of the attention from The New York Times article, Riffel also helped Tilson and Harper-Royal on their journeys to become the budding genealogists for their families. One of Tilson’s first discoveries was her blood relation to Crump. “A lot of my family members were shocked when I told them that we were related to Maxine,” she said. Jessica Tilson said Crump is the great-granddaughter to one of two sons Cornelius Hawkins had in his marriage to Eleanor Scott, the daughter of Bennet and Clare Scott, who also were aboard the same ship as Cornelius and his parents, Patrick and Letty Hawkins. Tilson said the Scotts lived next door to the Hawkins in Maringouin on West Oaks Plantation — where the Georgetown slaves shipped to Iberville Parish ended up. Tilson’s family members are direct descendants of Matilda Hawkins, Cornelius and Eleanor’s daughter. Harper-Royal has discovered her husband is a descendant of Francis Hawkins, Cornelius Hawkins’ brother, who also was a part of the 1838 sale. Besides her family tree, Tilson’s research also has led to the discovery of a bill of sale detailing how her great-great-great-grandfather James Henry Hicks in 1898 purchased land where West Oaks Plantation had been located. According to the faded document, Hicks paid $698 for 69 acres, which he did through annual installments of $118.68. Tilson said the family assumed Hicks has acquired the land through sharecropping. It wasn’t until recently that the property, which has been subdivided through the years to various family members who use it for farming, took on a more significant meaning as part of their family’s legacy. Tilson is organizing her research into a binder she hopes will become her family’s tome, detailing their history through documents and an extensive family tree. The marriages between the families of the Georgetown slaves is something history professor Adam Rothman suspected happened as he and his colleagues began piecing together what they could find about the lives of some of the 272 slaves after they were sold. The university has found baptismal and marriage records, ship manifests and bills of sale they have posted online at the Georgetown Slavery Archive. “It wasn’t until I saw the family tree Jessica has constructed did I see just how extensive all those ties are,” said Rothman, a member of Georgetown University’s Working Group on Slavery, Memory & Reconciliation, which has delved into this history. “It’s not shocking. We know that community was very close knit. They maintained these connections to each other through slavery and the emancipation. Rothman said recent discoveries by the university of baptismal records from a church in Newtown, Maryland, will help Tilson and other descendants trace their family roots to as far back as the early 1800s. The university’s Working Group is still exploring Georgetown’s history and involvement with the slave trade. Many of the descendants, like Harper-Royal, are anxiously waiting to see if the university will attempt to make amends for the sale, possibly through scholarships to the descendants to attend the prestigious university. Jonathan Monnet got an unexpected email Thanksgiving week of last year, suddenly filling in the dots of his family's fragmented past.